The 2013 Malibu LTZ, which offers heated front seats, remote start and 18-inch wheels, will have a sticker price of $28,590 with destination charges. DETROIT -- General Motors will nudge up the price of the base model Chevrolet Malibu when the next-generation family sedan goes on sale in August. The 2013 Malibu, which features GM's new 2.5-liter engine, will have a base price of $23,150 , including a $760 destination charge. That's a slight increase from the base 2012 model, which stickers for $22,870 with destination. It's also higher than some key competitors' redesigned mid-sized sedans. The price is $870 more than the base 2013 Altima and $335 above the base 2012 Toyota Camry. Prices have not been announced for the Ford Fusion and Honda Accord, which both go on sale this fall. Buyers of the redesigned Malibu will be getting a lot more for their money compared to the outgoing Malibu, GM says. The 2.5-liter engine will produce 197 hp, or 17 percent better than the outgoing 2.4-liter engine. GM says the Malibu also boasts a roomier, quieter cabin. More fuel-conscious buyers could choose the Malibu Eco, which GM launched in March, about six months ahead of the other engine choices. The Malibu Eco, which stickers for $26,095 with destination charges, uses GM's 2.4-liter engine mated to its eAssist mild hybrid system to get 37 mpg on the highway and 25 mpg in city driving. GM has been commanding higher transaction prices for its newer cars and trucks, which the automaker attributes to more desirable vehicles, strong residual values and better discipline in matching production with demand. In the first quarter, GM's average transaction price per vehicle in the United States rose $300 compared with a year earlier, while its average incentive fell $380 . Malibu sales rose 11 percent during the first five months of the year, to 110,035 , making it GM's top-selling car and No. 2 nameplate behind the Silverado pickup. 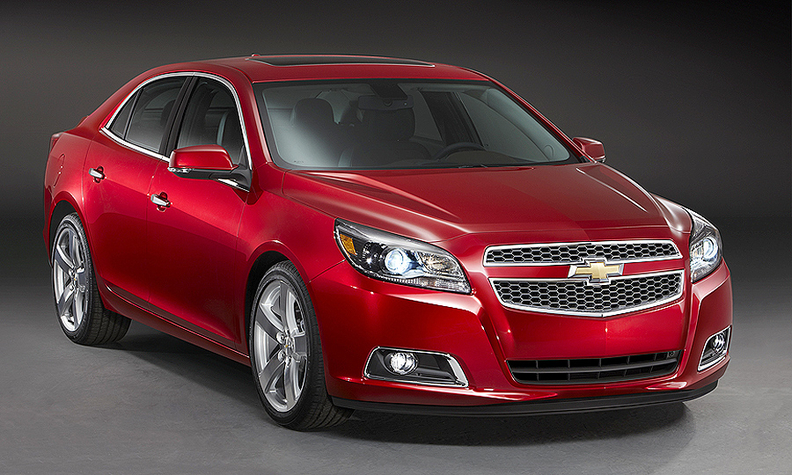 The base price on the 2013 Malibu's up-level trims will be slightly lower than prices on the 2012 models. The 2013 Malibu LTZ, which offers heated front seats, remote start and 18-inch wheels, will have a sticker price of $28,590 with destination charges. That trim level on a 2012 Malibu runs $29,245. Between the base LS and high-end LTZ models are the LT, which starts at $24,765 and the Eco. This fall, a 2.0-liter turbocharged engine will become available to round out the Malibu's powertrain lineup. It will be offered on the LT ($27,710) and LTZ ($30,925) . An optional safety package on the LTZ and some LT models adds a forward-collision alert system and lane departure warning.